Sometimes I have no idea where, when or why I got a certain book. The Briar King was that type of book. I honestly have no freaking idea what led me to buying it. I’m glad I did though, cause it turned out to be a great read. Aspar White is the holter of the King’s Forest, sworn to protect the forest from those who don’t belong there. But something is stirring within the forest and there are rumours that the Briar King, a legend from folklore, is waking. Princess Anne is the youngest daughter of the king of Crotheny and not willing to accept her responsibilities. She doesn’t want to sit around all day, doing embroidery and looking dainty; she much rather prefers racing her horse and visiting the crypts of her ancestors. Little does she know though, that the future of mankind might depend on her. Neil MeqVren is a squire for a highly respected knight and is hoping to be knighted himself soon. But that is only an honour those of noble blood can obtain and Neil has no birth claim to knighthood. Stephen Darige is the third son of a Virgenyan noble and has been promised to the church from childhood. He doesn’t mind though; he loves studying and decrypting ancient texts. But what if that what he’s deciphering wasn’t meant to be seen by human eyes? There are a couple of other minor characters, like the king of Crotheny, whose viewpoint we also sometimes get to see. All together they form a great bunch of likable characters. At first they seem a bit stereotypish (the headstrong princess, the loyal knight), but the plot around it is intriguing enough and it doesn’t fall in too many obvious cliches. While the story isn’t exactly fresh (something evil waking up, will bring the end of mankind, etc etc) The Briar King doesn’t feel ‘been there, done that, got the T-shirt’. You get the idea that it’s not as straightforward as it seems and that the Briar King isn’t the evil it appears to be. The magic in particular felt quite unique even though we didn’t get to see much of it yet (I’m hoping this will be expanded in the next books though). I’ve seen some other reviews complaining about the dialogue (uninspired and stilted) and the pacing, but I didn’t have any problems with those. To me, it was a quick and easy read, and with no lengthy descriptions about the scenery or surroundings (which can annoy me quite quickly). It’s not as political and complex as I would have liked it to be, but for a quick read it doesn’t demand for that. I did have a couple of minor problems with this book though. For starters, some of the weird words Keyes used. Now I’m not one to complain about ‘fantasy’ lingo; especially in fantasy books, authors create their own unique non English words to spice up the world a bit more and most of the time I actually quite like learning this new language. Here though it seemed a bit haphazard and not always clear what the word actually meant; it just didn’t feel as if it added anything. Another problem I had was with the chapter endings: almost every chapter (maybe even EVERY chapter) ended with a cliffhanger. Of course, the next time you got to that character it would be 2 or even 3 chapters later and the cliffhanger would be easily resolved. It’s a simple and often used plot device and normally I wouldn’t mind it that much, but here it just seemed overused (the Da Vinci Code gimmick). I’m curious to the next books (I’ve ordered them already on Amazon and they should be here within the week), especially cause I know this is a series that won’t be dragged out. The fourth book has just been published and that will be the concluding one of this series. 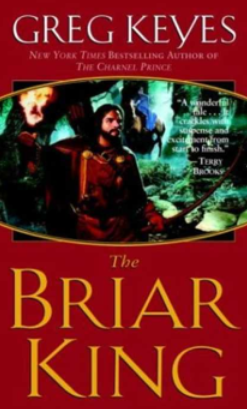 If you want something easy to read and get stuck into, definitely try The Briar King. It’s not as sophisticated and complex as other series out there, but (depending on how the next books are) this is a series I could come to love. 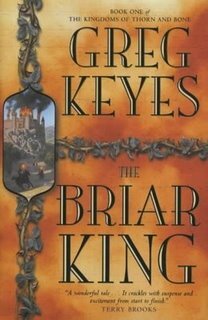 The Briar King by Greg Keyes is available on Amazon.com for $7.99 and on Amazon.co.uk for £5.49 .